Entrance doors from New Leaf are available in an almost infinite range of materials, styles, colours and finishes. We also offer an enormous selection of types of glass, trims, frame types, side panels and door hardware. Basically, just about any door you can imagine, we can supply. 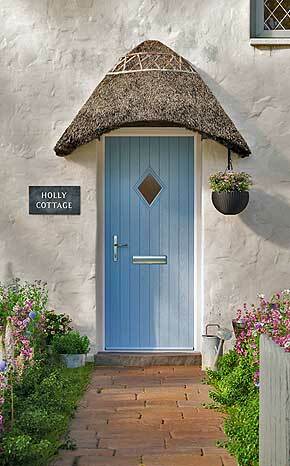 Our new door designer service is now available, offering superb quality composite doors manufactured by Door-Stop. This facility allows you to custom design your replacement front door from the comfort of your home and in your own time. You can save your design and send it automatically for us to provide you with a quotation. When you are ready to go ahead, we can either then supply or supply and fit for you. These doors are energy saving designs, police security approved, extremely comprehensively guaranteed and weatherproof to incredible standards. Not to mention very attractive! We also supply and fit timber doors. These are high performance, traditional or modern designs. Manufactured from grade 1 hardwood for durability and lasting quality, they are crafted with wedged mortice and tenon joints for strength. All our timber doors are pre-hung and finished in our workshops and are available in a very extensive choice of designs and finishes. Doors are available in bare timber, or factory paint or stain finishes. The paint and stain finishes incorporate micro-porous sealant, primers and top coats. There is an almost unlimited choice of colours and this finish provides long-lasting weather protection and elasticity, eliminating the risk of distortion.